Derry City boss Kenny Shiels expects a tough match in Dundalk tonight. 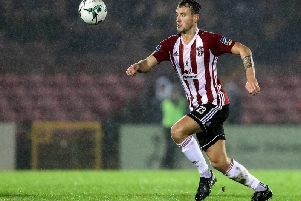 Dundalk have matched Derry’s incredible seven game winning streak in all competitions but while the ‘Candy Stripes’ have conceded 13 times in 10 outings, the Co. Louth men have just one goal in the table’s against column. Unbeaten in the league, Dundalk certainly boast the meanest defence and Shiels knows it’s going to take all his side’s ingenuity and ‘flair’ to get something from the game. “I think it’s going to be very tough,” said the City boss. “If you look at football, the team that makes the least mistakes wins the match normally. That’s the portion of the game Dundalk are the best at. They’re the best at not making mistakes. “When you get three 0-0 draws that’s quite evident. I’m not saying they’re the most attractive team to watch because of their rigidity and reluctance to play high risk football. While ‘attack wins you games, defence wins you titles,’ and Shiels is fully aware his young side are coming up against one of the best teams in the country in the disposed champions, who are desperate to wrestle the crown back from Cork. “They are very efficient and what they do is very professional. They go to get wins and have an amazing amount of quality in their team. “Without a doubt they are one of, if not the, best teams in the league.